Dubai: Wearable tech might just be what the doctor ordered. Every section of the health care industry is now pushing these products by focusing on the benefits. Real-time health monitoring, fitness, chronic disease management and elderly care are the main benefits from having these devices on. “The health care sector continue to be highly fragmented — but dramatic changes in tech-led innovations could improve the coordinated efforts among participants,” said Ayse Kaptanoglu, senior analyst at International Data Corporation. These initiatives will be mostly supported by technologies such as IoT-enabled services and wearable devices. The industry is already using or planning to use health-specific apps, with a focus on preventive care and continuous monitoring of health. The new capabilities of the Apple Watch 4 have taken medical diagnostics to a new level, while other brands have showcased products with health care benefits at the latest Consumer Electronics Show in Las Vegas. DreamOn had a device that uses low-frequency pulses to put one to sleep faster, Withings’ smartwatch monitors blood pressure and is capable of tracking ECG, Welt’s “smart belt” helps track fitness benefits, while Omron developed a smartwatch capable of taking blood pressure readings. L’Oreal’s My Skin Track pH detects skin pH levels through sweat and recommends skincare products, while the Cronolife vest predicts heart-attacks before they could happen. Kaptanoglu said that the ability for early detection of cardiac abnormalities will save lives, encourage more healthy behaviour, and provide additional insights for caregivers. IDC expects the trend towards medically intelligent devices as an extension of consumer technology adoption. According to Juniper Research’s latest report, health care spend in wearables is expected to reach $60 billion by 2023 as monitoring devices and hearables become must haves in delivering care. And that five million individuals will be remotely monitored by health care providers by 2023. Kaptanoglu said that such transformations are helping the industry shift from product-oriented to customer-centric strategies. 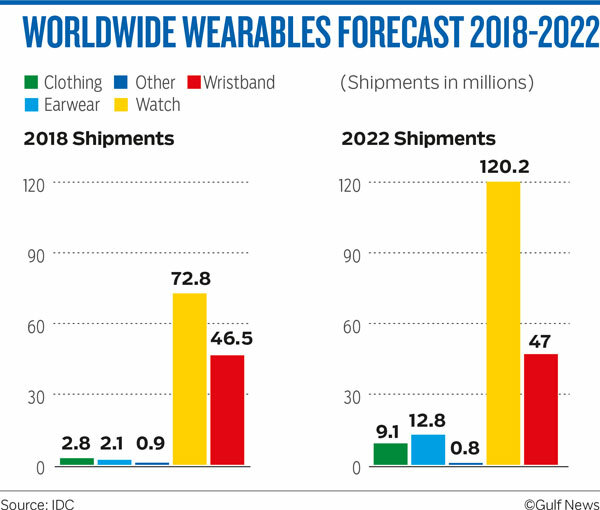 According to IDC’s consumer wearables survey, health and fitness purposes are the most desirable features for 80 per cent, followed by weather and multimedia purpose. A majority of the consumers agree that wearables are useful with the purpose of understanding health conditions. “We can see some use cases globally such as health insurance companies implementing wellness-based initiatives to specifically encourage and integrate fitness regimes into the lives of customers,” said Kaptanoglu. With the help of remote monitoring, customers could track their health and monitor their susceptibility to diseases without making costlier trips to the doctor. The demand for wearable devices is not purely driven by digitally savvy customers alone; it is also being shaped by the increasing adoption by health care providers for remote patient monitoring, better utilisation of resources, and operations tracking. Privacy and data security breaches are among the top concerns of health care operators about wearable devices. “The increasing number of users is expected to generate a continuous flow of large volumes of data and create security concerns while delivering care, monitoring patients, and tracking physical assets,” said Ayse Kaptanoglu of IDC.